This hotel is a charming 19-century mansion located in a quiet square less than a 20-minute walk from the Arc de Triomphe and Boulevard Haussmann's shopping district. 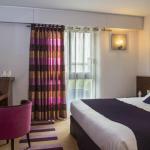 It offers free Wi-Fi.All soundproofed rooms at the Best Western Hôtel de Neuville have a modern style and are fully equipped with a TV and en suite facilities.Breakfast is served either in your room or in the breakfast room with a view over the patio.Hôtel de Neuville features a bar where guests can enjoy a drink. It has a 24-hour front desk service, an elevator that can take guests to their rooms and a shuttle service can be organised at the hotel to take guests to the airport.The closest Metro and RER Station to the Best Western is Pereire Levallois, which offer direct access to Le Louvre, the Eiffel Tower and other of Paris' sought-after attractions.